Director of National Intelligence James Clapper is rolling out new measures Monday aimed at ending what recently has been a spate of leaks regarding classified programs and operations. Among Clapper's recommendations, to be instituted across the 16 intelligence agencies, are an enhanced counterintelligence polygraph test for employees who have access to classified information, and the establishment of a task force of intelligence community inspectors general that will have the ability to conduct independent investigations across agencies in coordination with the Office of the National Counterintelligence Executive. Clapper has also called for a review of current policies that relate to interaction with members of the media, and how that interaction must be reported. The new question that will be added to the current counterintelligence polygraph test - which intelligence community employees who handle classified information are required to take - will specifically ask whether the employee has disclosed classified information to a member of the media. 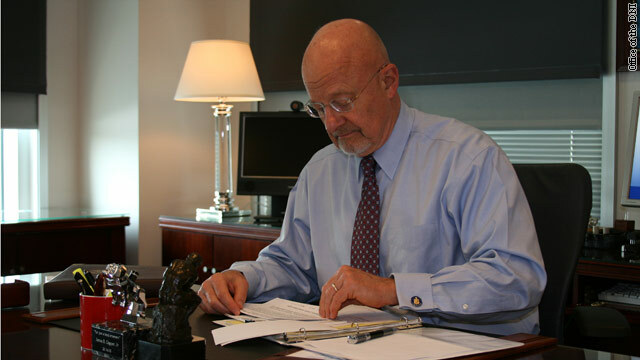 Clapper is using his authority to direct that the question be added by all intelligence community agencies that use the polygraph test, including the CIA, the Defense Intelligence Agency, the Department of Energy, the FBI, the National Geospatial-Intelligence Agency, the National Reconnaissance Office, and the National Security Agency. Clapper also is establishing a lead task force of investigators housed within his office to make the investigation of leaks more seamless. That move could also overcome an internal problem in the investigation of such leaks, which is that the Department of Justice, which is responsible for such investigations, often recuses itself because of possible conflicts of interest. Recent leaks of classified information include revealing in May that a mole had been working to help thwart a Yemen bomb plot targeting the United States, as well as disclosing the classified drone program and that the United States and Israel were behind a cyberwarfare program known as Stuxnet, which targeted an Iranian nuclear enrichment facility, causing centrifuges to spin out of control. The FBI is currently investigating the Yemen and Stuxnet leaks. According to the director of communication for the Intelligence community, Shawn Turner, while the new directives will apply only to the intelligence community, Clapper believes that the sources of leaks in Washington spans multiple government agencies, departments and even branches of government. The new measures will not apply to other agencies that handle classified information, such as the Department of State, Department of Energy, Department of Homeland Security, or Department of Defense, nor will they apply to members of the National Security Council, who advise the president on sensitive and classified programs. Republican Sen. John McCain of Arizona has accused the White House of leaking classified information in an effort to make the president appear tough on national security just months before the presidential election. White House officials have emphatically denied the claims, and some high-profile Democratic lawmakers have come to their defense. Clapper has met with the top-ranking members of both the House and Senate intelligence committees in recent weeks and is expected back on Capitol Hill this week to detail the new measures. The Chair of the House intelligence committee welcomed the new measures, saying that what he called 'the parade of recent leaks' is unacceptable. "DNI Clapper's announcement today is a good first step into not only deterring leaks, but also detecting when they happen so those responsible can be prosecuted," said Mike Rogers. Republican lawmakers led by Senator John McCain will hold a press conference on the leaks issue on Tuesday morning. While something certainly needs to be done about the leaks, the polygraph is an unreliable method of detecting leakers. As the Project On Government Oversight has noted, studies have shown that tests that are sensitive enough to spot liars will also mark large numbers of innocent people as guilty. There is also a threat that the polygraph will be turned into yet another retaliation tool against whistleblowers, who still do not have adequate protection at many intelligence and security agencies. Thank you, Mossad. How true that is. Thanks to the M.I.C., this is getting closer and closer to being the 4th Reich and we fought WW2 to end the third! How absurd this is!!! The leak didn't come from intelligence professionals in the intelligence community. It came from politicians or insiders who get the information from the intelligence analysts. We should start by giving the politicians polygraphs and having them go through a security investigation. These new rules will not fix the problem. PFC Manning and Wikileaks: Made the White House, the State Department, the Army, etc., look BAD. Stuxnet: Obama started this right when he entered office, it was his baby, and when it leaked it made his administration look BAD. Whoever leaked it knew he or she was putting egg on Obama's face. The President's involvement in "kill lists" of terrorists: The Chief Executive had better be involved when it comes time to decide which citizens of foreign counties we're going to execute. Who did people think made that decision, some Lt. Colonel in the basement of the Pentagon? Yemen: At least 4 national governments were involved in that operation, and the leak came out of GERMANY. The bin Laden raid: Everybody blabbed except the SEALs themselves. Detailed information about the raid (such as the Dr.'s involvement) didn't leak until members of Congress demanded and received that information. That's what DCI Clapper means when he talks about "multiple branches of government" dropping the ball. Suggestions that these leaks originated in the White House to make the President look good are election-year absurdities, and Senator McCain should know better than to play politics with national security. Er, how about electing people with some class and integrity for a change? Seems you wouldn't need all these extra measures if the people at the top were of a better character. How sad is that? How about enforcing the laws we already have and prosecuting members of the government who leak information for political purposes – or for any other reason? The lack of punishment for such leaks, even ignoring routine investigations of them, is appalling and serves as a disincentive to the thousands of cleared personnel who do follow the rules. Clapper on the c r a p p e r.
Identify the preditor and deal with it, treason should be stand behind bars. Oh please, who ever is leaking keep leaking. Tell us Americans more, we need to know everything. Keep it coming. I just want the juicy stuff. It won't be an easy task. If someone decides to leak something to the press without permission from their superiors, even if it isn't a matter of national security, that person opens themselves up to being blackmailed for further details, ad infinitum. Good luck with that problem. No intelligence professional leaked this information. Intelligence professionals have pride in their jobs, already take polygraphs, and have to account for all sources of income. This was leaked by a political insider in the Obama White House – just trying to score points for the administration. SEN DIANE FEINSTEIN ratted out the Pakistan Predator base and still walks free. That SECURITY LEAK (shown on CNN) endangered American lives causing the threat level to go up and ground tactics to be adjusted accordingly. Now that monumental hypocrite is calling for a plumber to fix the leaks? Why not bring back executions for espionage or treason? Make it swift justice and not some drawn out decades affair. Especially in an age where one can easly download to a zip drive and pass it off at a secret location. It is so easy to pass on information and data without a blink of an eye. The US gives our enemies and their domestic collaborators too much license to do what they want in fear that their freedoms (to do harm) might be violated; you know there is some slime ball defense attourney who is trying to,make a name for himself will find all kinds of angles for the spy's defense. Right. Let's not bother with trials for these people. Who cares if they're not really guilty but only charged with something (like well over half of the people held in Guantanamo over the past 11 years). Let's not give them any chance to get a lawyer who's going to insisit the state prove it's case. Oh. And I hope YOU never need a lawyer for anything. Afterall you wouldn't want a slimeball to represent you would you? And no, I'm not an attorney, just a person who, unlike you, believes in innocent until proven guilty and real justice. If anything, these so-called "leaks" actually helped Obama in making him look "tough" on his war against Islam. With all the Islamophobia sweeping the country these days, that's a big Plus for this bozo President! If you want to stop the leaks you have to get rid of Obama and his inner circle of traitors. Something called plausible deniability. See, now the world KNOWS the usa is involved in Crimes Against Humanity as opposed to just suspecting it. Big difference. The usa conducts activities today that we used to associate with evil bad-guys in a hollywood movie: Death lists, Extra-judicial assassinations, Kidnappings, Torture, Black prison system. These disclosures have proven that no longer is the usa a nation of laws and justice. Sad. Yeah, its important that they cover their tracks more so that their docile, sheep known as citizens don't increasingly become aware of their illegal activities. And stuxnet could have actually started a war with Iran because we were interfering with things that don't concern us. Iran has no capability of getting a nuke to us, and Israel has more than ample defense and intelligence to thwart Iran on their own. Thank you, Jason K. That was well said. They didn't mention contractors. Why don't they just polygraph everyone in the USA, call it national truth screening, make it s contest with prizes. I'm sure everyone will gladly take it for $50. Yes, call it a stimulus. WHO DID THE LEAKS ?? DID OBAMA INSERT EXECUTIVE P AGAIN TO COVER IT UP ???? He most probably did, JOSE. This bozo wants to get reelected. get rid of VP Biden. case solved. American security needs to come first and foremost.All else should follow,including the subjects you have mentioned. DENNIST-–AMERICANS SHOULD COME FIRST PERIOD, INCLUDING GIVING AMERICANS THE JOBS FIRST BEFORE ANY FOREIGNERS. ALSO OUR SECURITY... OBAMA IS PLAYING POLITICS WITH IMMIGRATION AND WITH VOTER PURGING. Find them, try them and if Any lives were lost as a result, shoot them. More Government control. One day they will strangulate themselves because of all this control. Could This money not be spent on improving the school system ? or a rail network , public transport ? What is the worth of the school or rail system, public transport, or anything for that matter, when it's all controlled by the Chinese because some liberal didn't want their country to be secure? Guess we should just give the Ruskies the codes for our nukes while we are at it amirite? But there is such a thing as too much of this garbage too. What's the point of security if we have poors schools or health care, or public transport or anything for that matter if the government simply uses national security as an excuse to further invade our lives. YOU can give up liberty for security but I want no part of it.